Chi-square Goodness of Fit is a statistical test commonly used to compare observed data with data we would expect to obtain. Were the deviations (differences between observed and expected) the result of chance, or were they due to other factors? "There is not a significant difference between what was observed and what was expected; any difference between observed and expected is likely due to chance and sampling error." 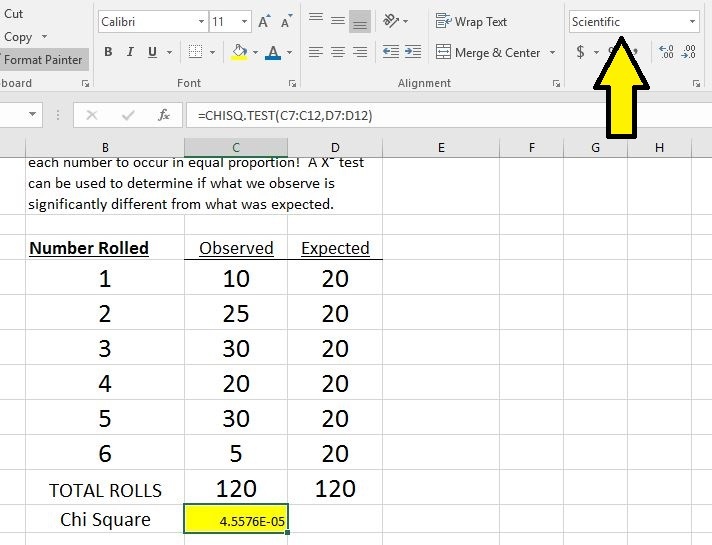 There is no significant difference between the numbers rolled on the die; the differences seen between numbers may be due to chance and sampling error. "There is a significant difference between what was observed and what was expected; the differences between observed and expected is likely not due to chance or sampling error." 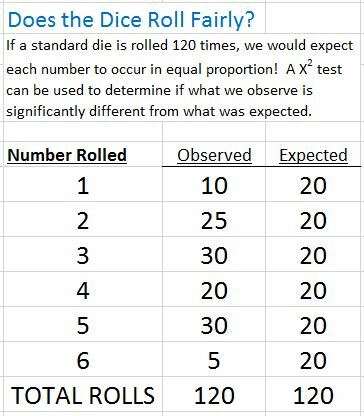 There is a significant difference between the numbers rolled on the die; the differences seen between numbers are likely not due to chance or sampling error. The results are added together to get a final X2 value. ​The calculated X2 value is than compared to the “critical value X2” found in an X2 distribution table. ​The X2 distribution table is organized by the Level of Significance. The level of significance is the maximum tolerable probability of accepting a false null hypothesis. We use 0.05. If our calculated value is lower than the 0.05 level of significance, we can accept our null hypothesis and conclude that there is NO significant difference between the observed and expected values. If our calculated value is higher than the 0.05 level of significance, we can reject our null hypothesis and conclude that there IS a significant difference between the observed and expected values. The formula to use is =CHITEST(observed_range, expected_range). Where "observed_range" is the counts associated with each category of data and "expected_range" is the expected counts for each category under the null hypothesis. ​Enter your observed and expected values in columns. Select all of your observed (actual) results for the Actual_range and all of your expected results for the Expected_range. The resulting value is the P value for the Chi-Square test. If you don't want it to be in scientific notation, you can change the format of the number by selecting "number" instead of "scientific." Now press STAT. Under the TESTS sub-menu, scroll down and select C:X2 TEST. Press ENTER.